Astronomers using ESO’s Very Large Telescope and the Canada-France-Hawaii Telescope have identified a body that is very probably a planet wandering through space without a parent star. These worlds could be common — perhaps as numerous as normal stars. 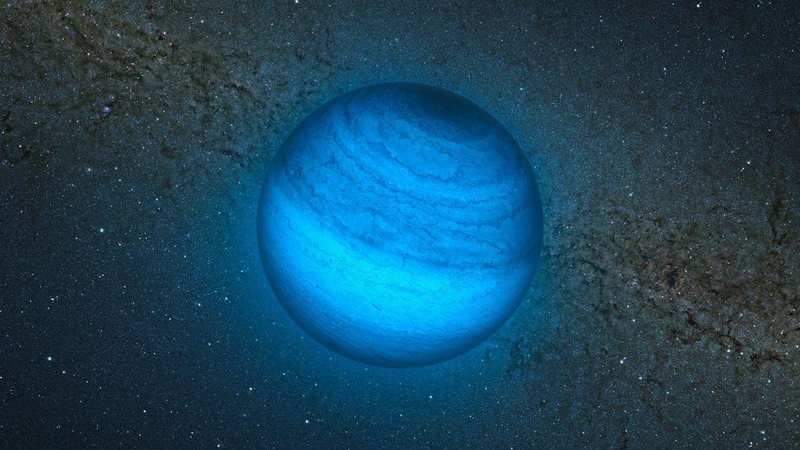 This is the most exciting free-floating planet candidate so far and the closest such object to the Solar System at a distance of about 100 light-years. Its comparative proximity, and the absence of a bright star very close to it, has allowed the team to study its atmosphere in great detail. This object also gives astronomers a preview of the exoplanets that future instruments aim to image around stars other than the Sun. Free-floating planets are planetary-mass objects that roam through space without any ties to a star. Possible examples of such objects have been found before, but without knowing their ages, it was not possible for astronomers to know whether they were really planets or brown dwarfs — “failed” stars that lack the bulk to trigger the reactions that make stars shine. These rogue objects started to become known in the 1990s, when astronomers found that the point at which a brown dwarf crosses over into the planetary mass range is difficult to determine. More recent studies have suggested that there may be huge numbers of these little bodies in our galaxy, a population numbering almost twice as many as the main sequence stars present. But astronomers have now discovered an object, labelled CFBDSIR2149, that seems to be part of a nearby stream of young stars known as the AB Doradus Moving Group. The object was identified as part of an infrared extension of the Canada-France Brown Dwarfs Survey (CFBDS), a project hunting for cool brown dwarf stars. The researchers found the object in observations from the Canada-France-Hawaii Telescope and harnessed the power of ESO’s Very Large Telescope to examine its properties. The AB Doradus Moving Group is the closest such group to the Solar System. Its stars drift through space together and are thought to have formed at the same time. If the object is associated with this moving group — and hence it is a young object — it is possible to deduce much more about it, including its temperature, mass, and what its atmosphere is made of. There remains a small probability that the association with the moving group is by chance. The link between the new object and the moving group is the vital clue that allows astronomers to find the age of the newly discovered object. This is the first isolated planetary mass object ever identified in a moving group, and the association with this group makes it the most interesting free-floating planet candidate identified so far.The team’s statistical analysis of the object’s proper motion — its angular change in position across the sky each year — shows an 87% probability that the object is associated with the AB Doradus Moving Group, and more than 95% probability that it is young enough to be of planetary mass, making it much more likely to be a rogue planet rather than a small “failed” star. More distant free-floating planet candidates have been found before in very young star clusters, but could not be studied in detail. If CFBDSIR2149 is not associated with the AB Doradus Moving Group it is trickier to be sure of its nature and properties, and it may instead be characterised as a small brown dwarf. Both scenarios represent important questions about how planets and stars form and behave.